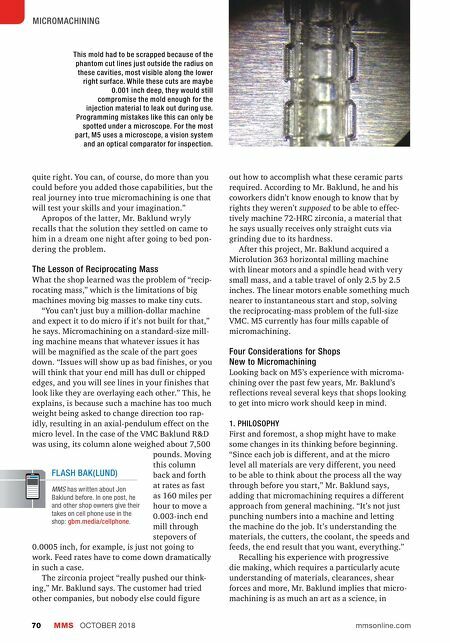 MMS OCTOBER 2018 70 mmsonline.com MICROMACHINING quite right. You can, of course, do more than you could before you added those capabilities, but the real journey into true micromachining is one that will test your skills and your imagination." Apropos of the latter, Mr. Baklund wryly recalls that the solution they settled on came to him in a dream one night after going to bed pon- dering the problem. The Lesson of Reciprocating Mass What the shop learned was the problem of "recip- rocating mass," which is the limitations of big machines moving big masses to make tiny cuts. "You can't just buy a million-dollar machine and expect it to do micro if it's not built for that," he says. Micromachining on a standard-size mill- ing machine means that whatever issues it has will be magnified as the scale of the part goes down. "Issues will show up as bad finishes, or you will think that your end mill has dull or chipped edges, and you will see lines in your finishes that look like they are overlaying each other." This, he explains, is because such a machine has too much weight being asked to change direction too rap- idly, resulting in an axial-pendulum effect on the micro level. In the case of the VMC Baklund R&D was using, its column alone weighed about 7,500 pounds. Moving this column back and forth at rates as fast as 160 miles per hour to move a 0.003-inch end mill through stepovers of 0.0005 inch, for example, is just not going to work. Feed rates have to come down dramatically in such a case. The zirconia project "really pushed our think- ing," Mr. Baklund says. The customer had tried other companies, but nobody else could figure out how to accomplish what these ceramic parts required. According to Mr. Baklund, he and his coworkers didn't know enough to know that by rights they weren't supposed to be able to effec- tively machine 72-HRC zirconia, a material that he says usually receives only straight cuts via grinding due to its hardness. After this project, Mr. Baklund acquired a Microlution 363 horizontal milling machine with linear motors and a spindle head with very small mass, and a table travel of only 2.5 by 2.5 inches. The linear motors enable something much nearer to instantaneous start and stop, solving the reciprocating-mass problem of the full-size VMC. M5 currently has four mills capable of micromachining. Four Considerations for Shops New to Micromachining Looking back on M5's experience with microma- chining over the past few years, Mr. Baklund's ref lections reveal several keys that shops looking to get into micro work should keep in mind. 1. PHILOSOPHY First and foremost, a shop might have to make some changes in its thinking before beginning. "Since each job is different, and at the micro level all materials are very different, you need to be able to think about the process all the way through before you start," Mr. Baklund says, adding that micromachining requires a different approach from general machining. "It's not just punching numbers into a machine and letting the machine do the job. It's understanding the materials, the cutters, the coolant, the speeds and feeds, the end result that you want, everything." 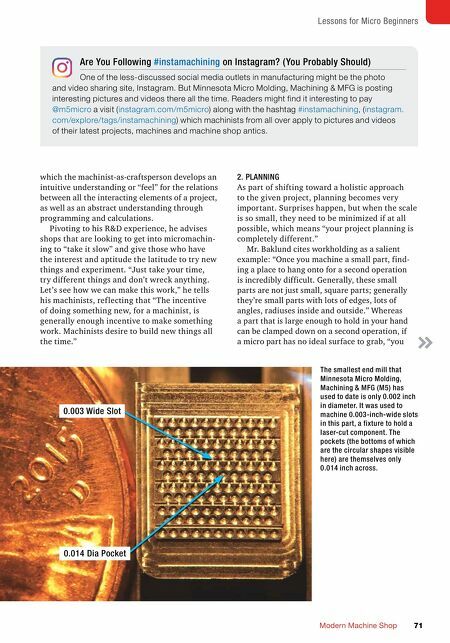 Recalling his experience with progressive die making, which requires a particularly acute understanding of materials, clearances, shear forces and more, Mr. Baklund implies that micro- machining is as much an art as a science, in FLASH BAK(LUND) MMS has written about Jon Baklund before. In one post, he and other shop owners give their takes on cell phone use in the shop: gbm.media/cellphone. This mold had to be scrapped because of the phantom cut lines just outside the radius on these cavities, most visible along the lower right surface. While these cuts are maybe 0.001 inch deep, they would still compromise the mold enough for the injection material to leak out during use. Programming mistakes like this can only be spotted under a microscope. For the most part, M5 uses a microscope, a vision system and an optical comparator for inspection.